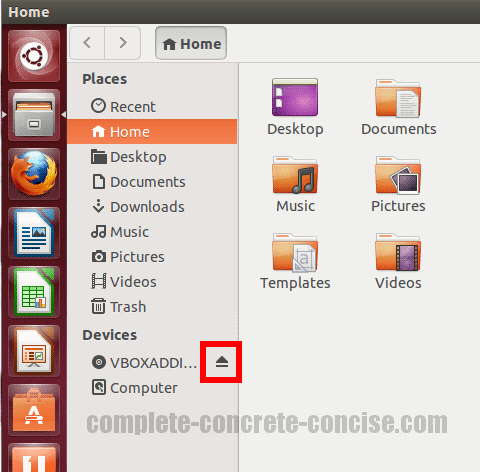 These instructions are for removing VirtualBox Guest Additions from Ubuntu 13.04 running under VirtualBox version 4.2.12. Note: everything at the command line is case sensitive, so make sure you get the UpPeR and lOwEr case letters right. Note: <username> is the name of the user who installed the VirtualBox Guest Additions. Note: Ubuntu makes it difficult (but not impossible) for someone other than the original installer to uninstall the VirtualBox Guest Additions. I am not covering how to do that here. Note: As a security feature, Linux does not echo back your password. When you type your password, it looks like nothing is happening on screen. This is normal.